The IKKT model is proposed as a non-perturbative formulation of superstring theory. We propose a Dirac operator on the noncommutative torus, which is consistent with the IKKT model, based on noncommutative geometry. Next, we consider zero-mode equations of the Dirac operator with magnetic fluxes. We find that zero-mode solutions have the chirality and the generation structures similar to the commutative case. Moreover, we compute Yukawa couplings of chiral matter fields. N. Ishibashi, H. Kawai, Y. Kitazawa and A. Tsuchiya, A large N reduced model as superstring, Nucl. Phys. B 498 (1997) 467 [hep-th/9612115] [INSPIRE]. 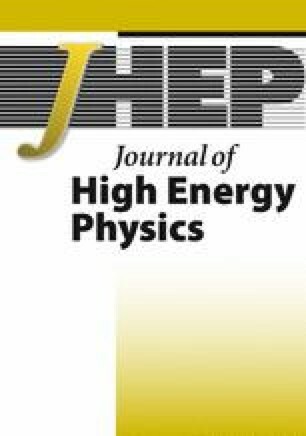 H.C. Steinacker and J. Zahn, An extended standard model and its Higgs geometry from the matrix model, PTEP 2014 (2014) 083B03 [arXiv:1401.2020] [INSPIRE]. A. Konechny and A.S. Schwarz, Compactification of M(atrix) theory on noncommutative toroidal orbifolds, Nucl. Phys. B 591 (2000) 667 [hep-th/9912185] [INSPIRE]. S. Walters, Toroidal orbifolds of ℤ3 and ℤ6 symmetries of noncommutative tori, Nucl. Phys. B 894 (2015) 496 [INSPIRE]. H. Abe, T. Kobayashi, H. Ohki, A. Oikawa and K. Sumita, Phenomenological aspects of 10D SYM theory with magnetized extra dimensions, Nucl. Phys. B 870 (2013) 30 [arXiv:1211.4317] [INSPIRE]. T. Asakawa and S. Matsuura, Spherical D-brane by Tachyon Condensation, PTEP 2018 (2018) 033B01 [arXiv:1703.10352] [INSPIRE]. T. Asakawa, G. Ishiki, T. Matsumoto, S. Matsuura and H. Muraki, Commutative Geometry for Non-commutative D-branes by Tachyon Condensation, PTEP 2018 (2018) 063B04 [arXiv:1804.00161] [INSPIRE].